September 17, 2013, 10:12 PM · It's the perfect Gateway Concerto for getting your friends and acquaintances hooked on classical music: Mozart Violin Concerto No. 5 in A major, K. 219, (“Turkish”). So far I've invited all my students and a few family members. I'm encouraging another friend to bring her elderly mom, and I'm hoping a few people will think about bringing their friend from work who has never attended a classical concert but kind of liked "Amadeus." As for Ben Beilman, since we spoke to him about a year ago, he's been busy concertizing and also spending much of his time in Germany, taking in the music there and studying with Christian Tetzlaff. 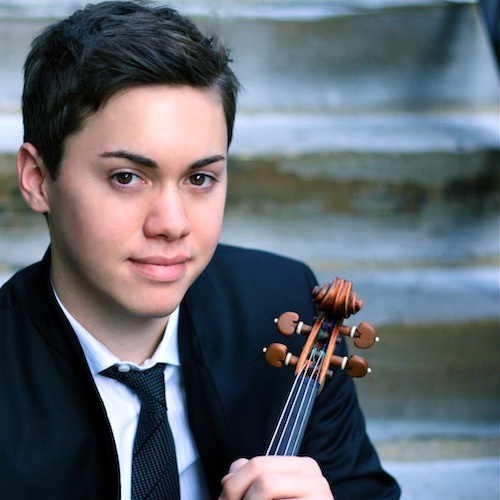 Ben, who received a 2012 Avery Fisher Career Grant and recorded the Prokofiev Complete Violin Sonatas last year, just completed a European tour with the Chamber Music Society of Lincoln Center and will give a recital at Carnegie Hall in November. Ben spoke to me over the phone last week from Hamburg about life after Curtis Institute, about playing Mozart after living in Germany, and about his Gagliano violin. Laurie: What have you been up to over the last year since I spoke to you? Ben: I've been splitting time in between living in Philadelphia and also in Frankfurt, both for concerts, but also last year I was studying with Christian Tetzlaff in Frankfurt. Whenever I could, I would fly over here for lessons. Laurie: What made you want to study with Christian, and what has it been like? That sounds like a wonderful opportunity. Ben: It's been truly extraordinary. Entering my final year at Curtis, I was looking at different options for continuing my study; I felt like I wasn't fully-formed as the musician that I wanted to become, and I needed a little bit more guidance. I looked at all the major music schools, especially on the East Coast -- a lot of Curtis kids go to NEC or Juilliard. But I had been intrigued by Christian's playing for a long time, and I always thought to myself, I'd love to spend some time in Germany. Working with Christian seemed to be a great fit. I first came into contact with studying with him through the Kronberg Academy; they sponsor violin master classes every two years, in the summer, for about a week or nine days. 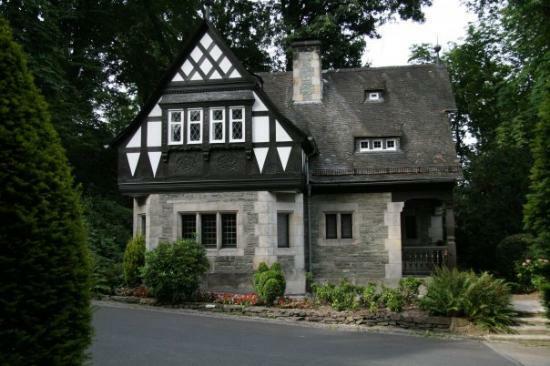 About 150 violinists apply and end up coming to Kronberg, which is a tiny, quaint suburb of Frankfurt -- imagine gingerbread houses, it's nice. So I applied for those master classes, and once I arrived, I auditioned to hopefully study with Christian. I was accepted, and I ended up having three lessons during that master class session. I worked on some Bach, and I worked on the Sibelius concerto. I already felt very comfortable with the Sibelius, but it was amazing because he took a piece that I felt like I knew very, very well and he completely turned it on its head for me. He opened up completely different avenues and ways of thinking. His biggest theme is about sound, and imagination with sound. That was fascinating. 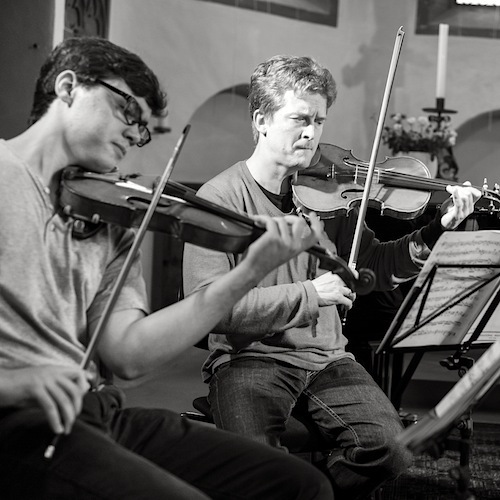 Ben Beilman with Christian Tetzlaff. Photo by Andreas Malkmus. Based on those lessons, I decided I wanted to study with Christian, once I was done with Curtis. So I went through the whole audition process in Kronberg, and I was accepted. We worked together over the last year; I worked with him every six or seven weeks. When I'm in town I'll see him maybe three or four times in a very short amount of time, then I go off and do my things, and obviously he is touring constantly. Laurie: I definitely know of him as a performer, but I really never had heard of him in the context of a teacher or mentor. Ben: He has just a handful of students at Kronberg; I think his class size is usually about three students. There's a violinist from Berlin who also studies with him; her name is Hyeyoon Park, and then Itamar Zorman, the top prizewinner at the Tchaikovsky Competition in 2011, also studied with him this last year. So he keeps his class very very small because he has to focus on his own things. But he likes teaching. Laurie: Do you speak German, then? Ben: I'm picking it up, little by little! I can order the food and drinks and say very minimal things -- I'm working on it. But I wouldn't say that I speak German. Laurie: Tell me a little bit about what an American classical musician can learn, just being in Germany? Has it changed your perspective at all? Ben: Absolutely. For me what was really fun, besides fantastic lessons with Christian, was just getting to know a completely different set of young musicians. In the United States, you grow up with the same musicians throughout your childhood. We go to things like Aspen Music Festival, or, I was an ENCORE kid when it was still around, or Perlman Music Program. Then you go to conservatory with them, and there's something wonderful about being familiar with all your classmates. But coming to a completely different continent, where you don't know those people, is also really cool. I've gotten to play alongside a whole different set of musicians and gotten to know great players that I just had absolutely no idea even existed. Laurie: Does it give you any different perspective on the history behind the music? I've often thought it would be nice to spend some extended time in Europe, just because that's where a lot of this music started. Ben: Attending concerts here, I'd say generally it's sort of the same demographic of people who attend the concerts, but there's a different esteem about it. You see more awareness about it around all the cities. It makes sense; for Germans especially, the cornerstone of their musical identity are these great composers that we know and love -- Beethoven, Bach, Brahms. We have Elvis. And of course, we have Gershwin and Bernstein, and those are fantastic, those are our American idols. But it's different if you have Beethoven and Brahms. Laurie: I'm looking forward to your concerts in Los Angeles; you're performing Mozart Concerto No. 5. Let's talk a little bit about Mozart. What do you enjoy most about playing Mozart? Ben: Coming back to especially this concerto, there's so much that I hear now through an operatic lens. People talk about it all the time, that with Mozart, everything was about the voice and singing. Somehow this time, it really clicked for me. I've had the opportunity to see a lot of operas in Germany, and I hear a lot of these gestures that he wrote in his violin concertos and his string quartets -- gestures which are absolutely for the voice. And so I guess it's been about diction and syntax for me this time around, in the concerto. Laurie: Do you have a favorite Mozart Concerto, of his five violin concertos? Ben: I see his five concertos as a sort of progression. There's so much merit in each one, and it's just impossible to say that one is better than the next. But to me, it feels like the fifth concerto is maybe the most concise in his ideas, and what he wants to say. It's almost more varied than some of the other ones, and that's what I enjoy about it. Laurie: It seems like you're getting into a routine of traveling and soloing -- do you have any more perspective about it, as far as what this lifestyle is like? People study to be a soloist, but sometimes I wonder if they know what they're signing up for! Any advise for your younger colleagues? Ben: I have noticed, especially in this last year since graduating from Curtis and being on the road more, that you need to know so much about your own personal limits. You have to make sure that you have a very, very good balance of certain cornerstone ideas: places of refuge and resilience that are completely separate from music. You have to make more of an effort to stay in touch with your family and friends, obviously, when you're traveling a lot. Also, for a long time, I was getting really stressed about things and I didn't understand what was going on -- then I realized that I needed to go running a lot. So running is another source of refuge and stress reduction for me. Once you're traveling a lot, it's almost less about the actual performances and onstage time as it is about understanding how to feel sated and fulfilled outside of that. Ben: Absolutely. Even something as simple as a time change; a lot of it is knowing exactly how quickly your body can adjust, or what things you can do to help move that along. You need to know which flight to take, what time you're going to get in, how much sleep you can get on the plane, how much sleep you allow yourself the first night, the second night. It sounds boring and tedious, but it makes a huge difference, if you know how to plan that. Laurie: Have you ever had a situation where you felt like, "Oh, man, I shouldn't have taken the red-eye…"
Ben: (he laughs) No -- I will say, though, the first time I went to Asia… I had a concert in Kuala Lumpur with the Malaysian Philharmonic, and during that trip, I was there for a grand total of maybe four and a half or five days. In terms of travel time, you're close to that anyway; you're at three days, just getting there and getting back. That was one time when I realized that I needed to learn how to get into a system very quickly. I couldn't sleep, and then I slept too much -- it was tough. Some great advice that I've gotten from of my mentors in the past year is: You need to plan, months and years ahead of time, a complete break from the instrument. Christian says he takes a total of four or five weeks off a year. He'll usually space it out -- two during the holidays, maybe two in the summer and a week somewhere else. His whole mantra is that you have to know how to plan that for yourself, and you need to take the time and resist the temptation to accept a concert offer if it comes in during your vacation time. If they truly want you to come and play with them, or to play in recital, they can wait a year or two. Laurie: What violin are you playing these days? Ben: I'm playing an Antonio Gagliano from 1790. I've played it for almost six years, and fortunately, it's mine. I'm paying it off, essentially, but it's mine, nobody can take it away. I'm very, very happy with it. Laurie: That's a big achievement, if you actually have your own instrument. How did you find it? Ben: I bought it from Robertson and Sons in Albuquerque. I looked in all the major shops on the East Coast, in Chicago and various places. Ida Kavafian was the one who knew the Robertson's shop; she said, "Hey, since you haven't found anything, let me call my friend Aaron and see if he has anything." So they actually shipped me two instruments: one was a Vuillaume, and the other was this instrument. When you opened up the box, it looked like it was bomb-proofed, I mean they had packaged it so tightly and so perfectly! It's weird to think about an instrument of that value going through FedEx, but they made it work. And so I played the Vuillaume, and I thought, "Oh man, this is the one, this is great!" I almost didn't even want to try the Gagliano, but after a couple days I said, "Okay, just to confirm that the Vuillaume is the one, I'll try the Gagliano." And I tried the Gagliano and -- Okay, hands down, the Gagliano was the one! Laurie: Before that, had you had experience playing on fine instruments? Ben: Yes, fortunately, I'd had the use of a Carlos Tononi for about a year and a half before that; I played a Storioni, I tried a couple Strads and del Gesus in shops but never for an extended period. But I did have some long-term use of a nice instrument. Laurie: I'm glad you have your own instrument; so many people get it taken out from under them and it's just awful to hear about. Ben: Besides the idea of having something that you're so close to taken away from you, you also have to then spend however many weeks or months trying to readjust to a new one. So you're completely losing time, every time you borrow a new instrument. Laurie: Does your instrument adjust okay when you travel? Ben: Yes, I used to be so finicky with adjustments, and if something sounded a little different the next day, I would freak out and I'd think I needed to take it into the shop. But an attitude that I try to take these days comes from the violist Paul Neubauer, who famously says, "Oh, I don't believe in that stuff; that's just nonsense. An instrument sounds the way that it sounds." I think it's good to sort of trick yourself and think that there's nothing to worry about! September 18, 2013 at 11:58 PM · Great interview again, Laurie! I particularly like Ben’s comments on his European experience and meeting the great players he didn’t even know existed. I had the similar experience that after each music-related trip, my approach to playing and practicing the violin was always deeply affected. Ben’s comment about stop being finicky about the violin sound reminds me of a few interesting points Samuel Zygmyntowicz made during his recent BISQC lecture (http://www.youtube.com/watch?v=imTEp6JwYkw). Sound is such a complex thing and sometimes even if certain phenomena are real, they are not always supportable scientifically. It's wonderful to see a young great violinist is also so thoughtful and wise. September 19, 2013 at 10:54 PM · Very interesting interview, thanks! September 22, 2013 at 12:37 AM · Nice to hear from Benjamin.